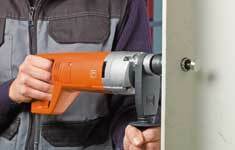 FEIN, the inventor of the power tool, presents the world&#39;s first hand-guided core drilling system for metal. The system combines the benefits of a high-performance hand drill with those of a carbide drill. The hand-guided FEIN core drilling system KBH 25 allows users to simply, quickly and comfortably drill holes up to 25 millimetres in diameter in metals up to 20 millimetres thick. The new system enables metal-processing companies to work with all common metals on curved, painted and uneven surfaces and in hard-to-reach places. The KBH 25 uses patent-pending technology developed by FEIN to enable hand-guided core drilling that combines a high-performance hand drill with special carbide core bits. The new drilling technique avoids cutting material unnecessarily and therefore greatly reduces the amount of effort required. The drill is centred by a HSS bit which only drills for as long as necessary and is disconnected as soon as the core bit encounters the material. This allows the entire feed force to be used for core drilling. Once the material has been penetrated, a pressure spring moves the centring drill forwards and ejects the drilled core. As the inventor of the world&#39;s first electric hand drill, FEIN has 115 years of experience in developing application solutions for drilling. By launching the FEIN metal core drilling system KBH 25, the long-standing company is responding to the demands of users who need a universal and compact, yet high-performance core drill for use with different materials and in different situations. Traditionally, metal workers have had to use hole saws or core drilling units with magnetic feet for drilling large hole diameters. Standard hole saws are attached to a normal drill with a drill chuck. They are easy to use, but require a lot of force. Stationary core drilling units are renowned for their outstanding performance, but given that they weigh at least ten kilograms, they are comparatively unwieldy and can only be used with magnetic metals at least ten millimetres thick. 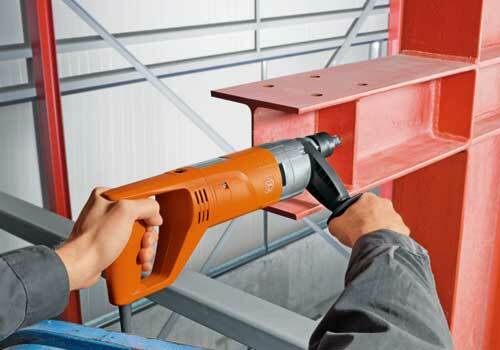 The FEIN KBH 25 with a core bit can work up to three times faster than standard hole saws and up to five times faster than conventional spiral drills.